Enjoy video of Paint the Town - 2017... 2018 plans are under way for another wonderful year of art, dinners, gatherings and simply a great week for all. How to see you painting, at dinner on the range, patrons & painters social or for the dinner and award on Sat. 20th starting at 5pm. Special Thank You to John Mosher for the creation of this special Paint the Town video. 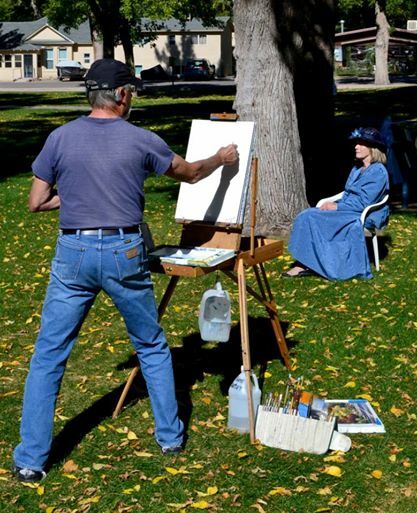 Six days of Plein Air painting fun amid the charming sights in and around historic downtown Florence, Colo. Local and regional artists will gather to compete, setting up their easels throughout town. The public is invited to watch them paint their interpretations of the area and to gather at the reception held at 5 p.m. Saturday, Oct. 19 at the Bell Tower Cultural Center, 201 E. Second St., where more than $3,000 in prize money will be awarded. The judge this year is Dena Peterson . 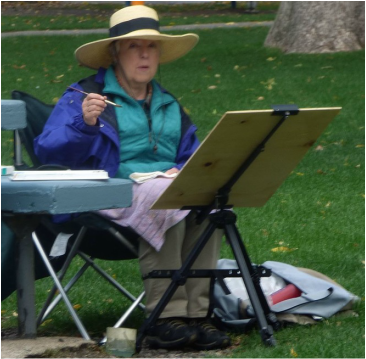 Plein Air is a French expression that means "in the open air" and is often used to describe the act of painting outdoors. Spectators of the Florence Arts Council Paint the Town event may see artists working on such scenes as historic buildings, doorways, colorful flowers or even people. Friday, Oct. 18 may be the best opportunity to see artists at work since they will be restricted to a six block radius of downtown Florence from the intersection of Pikes Peak and Main Streets. Another great event is the Quick Draw on Saturday 19th from 1 to 3 p.m. NEW MYSTERY LOCATION in Florence. New Mystery location is a fantastic site for all to paint or view. Artists will meet at the Bell Tower at 12pm for directions to the mystery location. Artists will create pieces from prop-set scenes, natural venue or mystery items within the mystery location and their work will be for sale at the Artists' Reception that follows. With a Chili/Soup supper. on highway 50 in Canon City, Florence Mountain park and other rural mountain vistas. Artists' "Dinner on the Range" evening at the home of Tom & Peg Piltingsrud surrounded by numerous painting venues. Enjoy a wonderful rural vistas to paint your afternoon into evening followed by supper at 5pm on Tuesday 16th. Painters/Patrons- Mingle @ Baker's will be evening of Friday, Oct. 18.